Listing courtesy of Craig Knizek (CalBRE #01377932), The Agency. Red Door Homes, a luxury design/build firm introduces The Homestead, an acre parcel with a residence, complete one bedroom guest house, and private grounds designed to give homage to the lifestyle of a Napa Valley vintner. 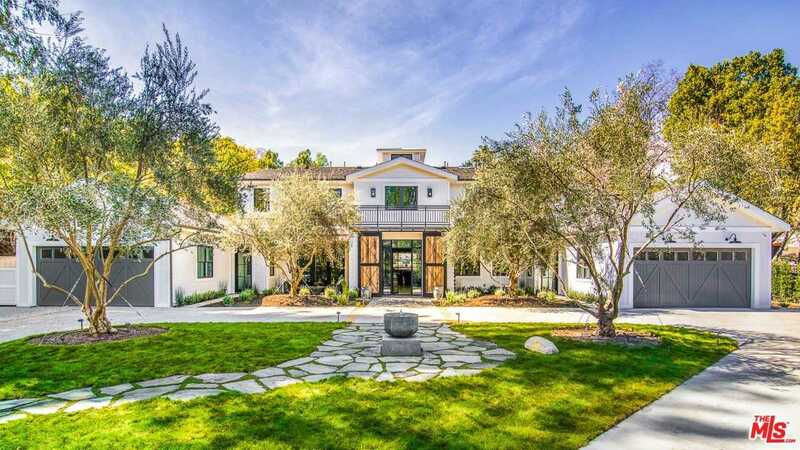 A long, gated drive reveals the main house where stone, steel, white oak paneling, European oak floors, and aged wood beams are amongst the fine finishes transforming this new construction into a bespoke custom home, juxtaposing organic beauty and refined finishes for the most discerning. The main floor offers a formal living room, formal dining room, great room with soaring high ceilings and a dramatic chandelier, center island kitchen and adjacent den, mudroom, library, huge home theatre and two en-suite bedrooms. Upstairs find four additional bedrooms including the master retreat and sitting room. Beautiful grounds include a large pool and infinity spa, outdoor kitchen, stone fireplace lounge, vineyard, raised planter vegetable gardens, and two, two car garages. Building size: 8815 sq ft. Please, send me more information on this property: MLS# 19452912 – $8,995,000 – 4701 Balboa Ave, Encino, CA 91316. I would like to schedule a showing appointment for this property: MLS# 19452912 – $8,995,000 – 4701 Balboa Ave, Encino, CA 91316.